One day in May each year thousands of old cars gathers in our town. The cars are mostly of American origin and from the fifties and the sixties. When the car show has ended in the afternoon, hundreds of the vehicles start cruising around the city centre. Until midnight there is a constant noise of running car engines from the slow paced procession, only interrupted by burnouts, hooting with the car horns and frequent revvings. The air become dense with fumes which creeps into my apartment. I live close to the cruising route and it doesn’t help to shut the windows. I am very grateful that it will all be over in a couple of hours. I did get to one of the corners of Skåne! Falsterbo Fyr at southwest. 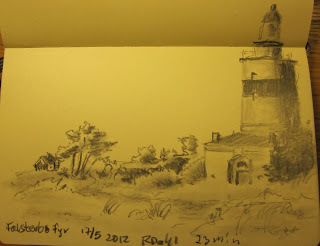 Today our small group of sketchers met up with Pedro and Patricia from Portugal. We visited The Museum of Sketches in Lund and after that we had a beer at the nearby Lundagård Café. 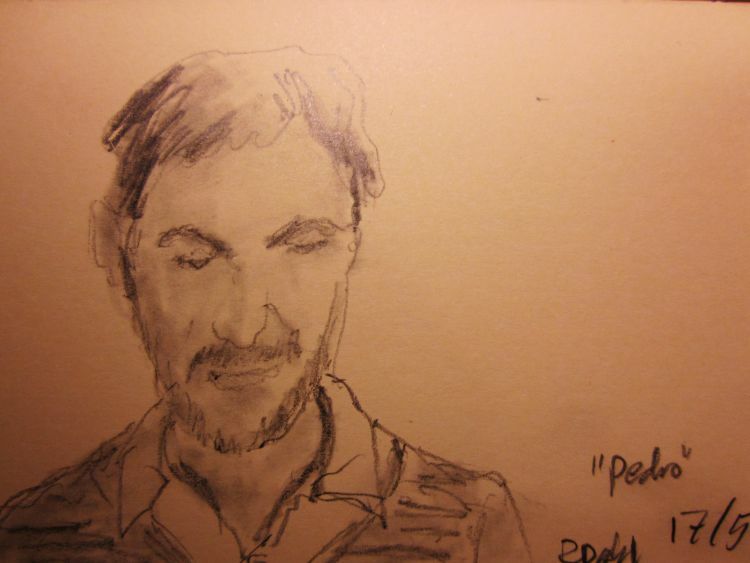 Pedro is an active urban sketcher and Patricia, despite saying: Jag kan inte rita which is Swedish for I cannot draw, made a nice portrait of Robert. 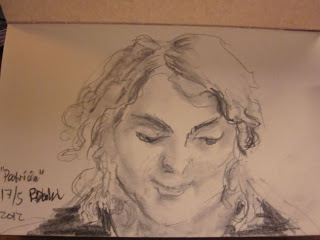 All five of us were sitting around the café table sketching each other. 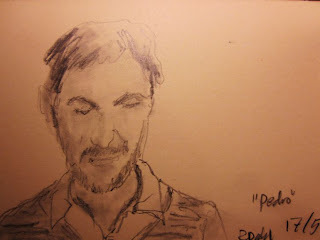 That is a special feeling, looking intently at another man or woman you don’t really know, trying to catch both the outline of the face and what’s hidden behind the surface: the personality. We had a short but very enjoyable afternoon and I hope we will meet Pedro and Patricia soon again.